Drivers who transport people (Uber or Lyft) or things (Uber Eats or Postmates) through an app made 53% less in 2017 than they did in 2013. Leasing apps — Airbnb and others that let you rent assets like your home, car or parking space — saw their incomes rise 69%. Demand hasnt increased to meet the increased number of drivers. Drivers are working fewer hours. Trip prices have fallen. Platforms are paying drivers lower rates. The gig isn’t as good as it used to be for people working through online transportation apps in the U.S. This is happening as online gig work has become more popular, thanks in large part to the growth in the number transportation jobs. 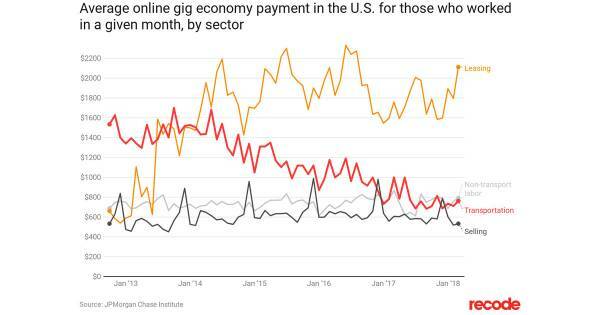 The share of the working population that has participated in the online gig economy at any point in a year rose from less than 2 percent in 2013 to nearly 5 percent in 2018. That’s about the same share of people employed in the public administration sector. About half, 2.4 percent, worked in transportation jobs this year, up from a tiny fraction of a percent in 2013. There are a number of potential reasons why the average pay for gig economy drivers has gone down. Drivers on average are working fewer hours. Demand hasn’t increased to meet the increased number of drivers. Platforms are paying drivers lower rates. In the U.S., more than 50 percent of drivers work less than 10 hours a week, according to Uber, whose previous research found that although trip prices have declined, the number of trips per hour has increased, offsetting changes in wages. Here’s a full response from Uber published today in a blog post. The JPMorgan data does not observe wages and hours separately, just overall earnings in a given month. The JPMorgan research is further evidence that online gig economy jobs supplement regular nine-to-five jobs rather than serve as full-time employment in their own right, as traditional employment alone is no longer enough to make ends meet for many Americans. Of those who worked for an online platform in any sector at any point in a given year, those wages represented no more than 20 percent of their total observed income on average, according to the JPMorgan study. Most accounts that generated revenue had earnings in three or fewer months of the year. The gig economy is notoriously difficult to measure, including anywhere from 5 percent to 40 percent of the population, depending on the parameters. This JPMorgan study focuses on jobs that are mediated through online platforms — what many of us think of when we think of the gig economy — while other studies often include freelance and contract work arranged by traditional methods. Its findings are also more reliable than that of other studies such as those from the Bureau of Labor Statistics, since it measures objective data rather than subjective survey responses. For this data, JPMorgan looked at 39 million Chase checking accounts between 2012 and 2018. When it first began this study, 42 platforms were included; now there are 128. The data, though, could be higher than the national average because Chase account holders skew younger and are more likely to live in the West than the population at large. The data could also be lower than it should be since it’s only including 128 online platforms — there may be more — and only observes payments that go into checking accounts, not into, say, PayPal.